Thousands of books and multimedia items are headed for the shredder as the University of Sydney Library embarks on a disposal process to free up space. Some of the books headed for shredding. Director of Library Site Services Coral Black told Honi the process only applies to duplicate copies of material and in particular ‘low use’ assets. “The work we are doing is something called collection maintenance, and it is something all academic and public libraries do,” she said. A cheat-sheet used by library staff titled ‘Low Use Duplicate Disposal Process — 2016’ described the process as “weeding” and provided a target of 60 books to be processed per hour. “The books being removed from the collection are going to a secure destruction facility,” the sheet reads. In response to a question about the decision to shred the materials instead of donating to students or in need libraries, Black said that re-purposing was logistically impossible. Black was unable to state the number of materials set for disposal but confirmed that it was certainly in the thousands, equating to around one per cent of the library’s 2.5 million items. Jenna Schroder, co-education officer of the Students’ Representative Council said that it was disappointing that the library was not donating the books. “18 months is a really short space of time to decide that a book is unnecessary,” Schroder said. “This will affect students, particularly honours, masters and PhD students because these books will primarily be research books”. Honi found 25 full-size wheelie bins belonging to the Shred-it company, either full or partially full of books, on level five of Fisher library. Inside was a variety of books of many genres, with a number of pristine 18th century texts among them. Some of the 25 wheelie bins used to collect books for shredding. Photograph: Nick Bonyhady. 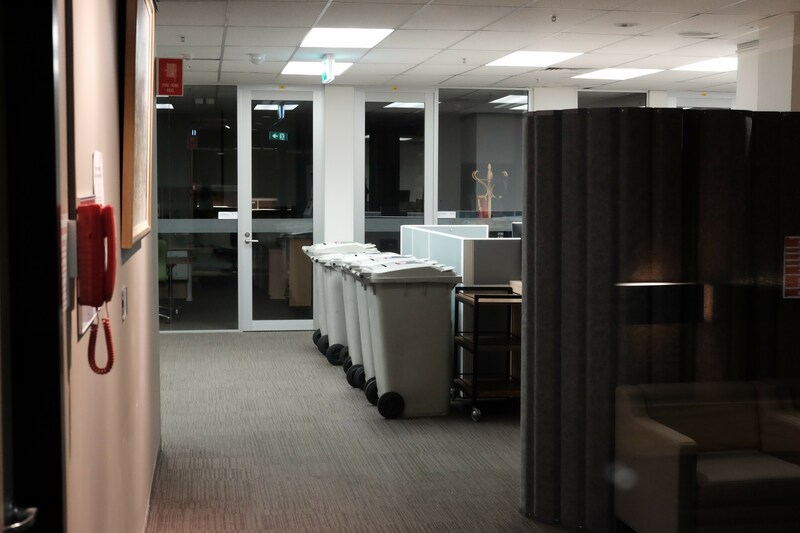 When looking through the bins, which were located in a public area of the Library, Honi editors were approached by library staff and told to not take the books as “they would set off an alarm”, despite their future as landfill. The Library Collection Management Principles, published on the library website, states “no more than one copy of a print title will be retained in the Library collection, unless the text is being used in current or continuing courses at the University” and that an “ongoing program of review, transfer or disposal is maintained”. Update: the library has contacted Honi to indicate that it’s earlier information that books had not been borrowed in 18 months was incorrect. Some of the items for disposal had not been borrowed in four years.